During the past three decades public concern about the environment has increased. The quality and quantity of the air we breathe, the water we drink, the food we eat, and the environments where we live have a profound impact on our health and well-being. Environmental health professionals are involved with improving our understanding of how environmental agents may affect health in order to promote health and prevent disease. Areas of environmental health science include assessing exposure to environmental agents, understanding the relationships between exposure and disease, and translating this knowledge into science-based policy. Environmental concerns have resulted in several major environmental policy decisions, including the creation of the EPA and the passage of the Safe Water Drinking Act, the Clean Air Act, the Occupational Safety and Health Act, and the Federal Environmental Pesticide Act. The purpose of this major is to develop individuals who have the education and training to deal with the complex environmental problems and issues of today and tomorrow. Students pursuing a major in Environmental Health Sciences also have the opportunity to complete an accelerated 5-year Master of Public Health (MPH) degree with a concentration in Environmental Health Sciences through the College of Health and Human Sciences. Purdue University is well-known for its prestigious education. 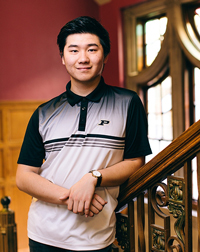 I chose Purdue for my undergraduate degree because I thought it would help me greatly in my graduate studies. The staff in the College of Health and Human Sciences have been really helpful in my transition to college. While each professor is unique in his or her own way, one characteristic is the same: they are all very friendly. HHS professors are very enthusiastic about what they teach, and when you have questions, they are more than willing to help you. The most popular advice given to me was "do not procrastinate." Well, that's easier said than done. What I would advise incoming students is to spread procrastination evenly. I take breaks between classes, and this makes me more productive than if I spend a huge chunk of time procrastinating. My favorite thing about Purdue is the marching band. It is probably the coolest thing I have seen on campus. I currently participate in the Environmental Science Club. In this student organization, members get hands-on experience with local area restoration and management techniques. We also participate in lectures from professors who explain what they do and how their professions benefit communities. I also volunteer at Food Finders Food Bank. This local organization helps people living in Greater Lafayette who are in need of food, shelter or medication. Both organizations have had an impact on my Purdue experience. Through my participation, I have discovered the needs of the environment and the people living in it. I have realized the impact my education and my future profession will have on people's lives and my potential to benefit a community. I also have learned how to manage my time more wisely by participating in these organizations.